UN Secretary General Ban Ki-moon speaks at the second UN Conference on Land Locked Developing Countries in Vienna this week. Photo courtesy of the Austrian Foreign Ministry flickr account used under a creative commons license. India continues to block the implementation of the 2013 World Trade Organization trade-facilitation agreement, refusing to push forward with the deal until the WTO guarantees protection of India’s massive state food purchases. It is now doubtful that a compromise can be reached before the G20 summit next week. Critics see India’s food stockpiling measures as amounting to harmful subsidies, artificially encouraging farmers to grow more food which may eventually be dumped on world markets. One year after the Typhoon Haiyan struck the Philippines, there is renewed attention on the affected areas. The UN estimates that 475,000 people are still living in unsafe or inadequate temporary shelters, some in areas considered dangerous. According to the mayor of hard-hit Tacloban, the city has only received about $5.5 million in aid from Manila despite international pledges of $1.6 billion for rebuilding in the Philippines. The Australian Department of Foreign Affairs and Trade (DFAT) will formally launch its Development Innovation Hub in early 2015 as part of Australia’s new foreign aid paradigm. The project has been in the works since being unveiled in June of this year. Australia has allocated $122.2 million in funding to encourage innovative new ways to deliver aid programs, which may open the door for private sector partners to be more active in the planning and design phase of projects. In response to the armed coup in Burkina Faso, Canadian Minister of International Development Christian Paradis announced that Canada will immediately suspend development assistance to Burkina Faso. International observers, including the African Union, have condemned the coup and are calling for a transition to civilian authority. Moody’s Investors Service cut South Africa’s foreign debt rating on Thursday from Baa1 to Baa2, moving the country’s rating in line with countries like Brazil and Russia. The rating was revised down on concerns about labor instability and power shortages. IFC launched a $450 million initiative to spur private sector trade and investment in Ebola-Affected countries. The initiative will include $250 million in rapid-response projects, and at least $200 million in investment projects to spur post-epidemic recovery. 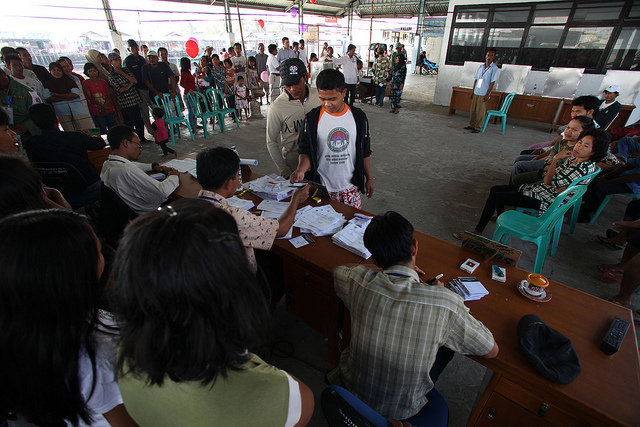 2009 Elections in Indonesia. Photo courtesy of Josh Etsey and Australia’s Department of Foreign Affairs and Trade used under a creative commons license. Citizen participation is critical to fostering social cohesion, inclusive development outcomes, and to ensuring transparency and accountability. Many of us know from personal experience, that the opportunities that we had for meaningful and positive participation in our youth, encouraged leadership and “soft” skills development, and set us up for lifelong engagement in civic and political processes. With strength in numbers, youth today represent a powerful and innovative force to constructively advocate for, and create solutions to community issues through volunteering, advisory councils, social media and communications, voting, and collaboration.